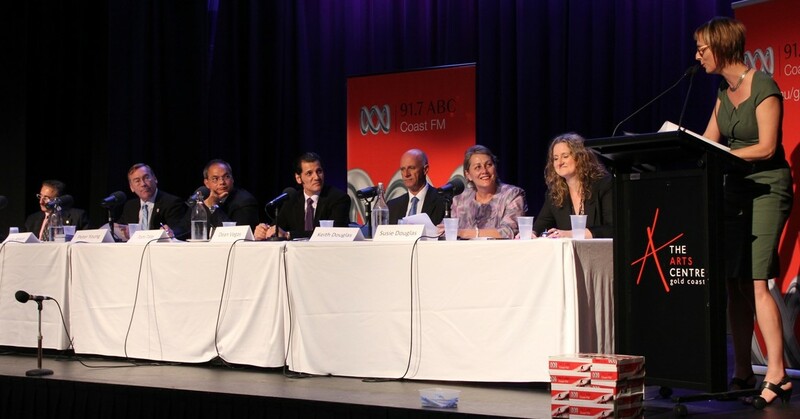 Big budget savings and a freeze on water rates were two of the promises made by Gold Coast candidates at ABC local radio’s mayoral debate this week. With only a week to go until local council elections, more than a hundred Gold Coast residents turned up to hear candidates address key local issues and outline their visions for the future of the city. Bringing savings to rate-payers was a big ticket item on the night, with Keith Douglas announcing he would put a one-year freeze on water rate increases, while Tom Tate promised to slash $80 million from the budget by selling off council land. “We have to get council back to living within its means, to be frugal again,” he said. Peter Young said council needed to spend available money wisely and said he would use state government funding for proposed heavy rail connections to extend light rail infrastructure instead. “There is a current budget proposition of $1.4 billion to expand the heavy rail network from Varsity to Elanora. I’m suggesting we can flip that money over into the light rail system and achieve a hell of a lot more outcome by extending light rail down to the Coolangatta Airport and into the Tweed,” he said. Current Surfers Paradise local member Susie Douglas avoided budget issues and addressed the Gold Coast’s waste disposal problems, saying she would introduce a world first ‘zero landfill’ policy. “We have terrible problems finding new landfill sites, it’s creating a lot of problems environmentally and for residential areas close by,” she said. Member for Broadbeach Eddie Sarroff, who is seen as a maverick in council chambers, said he was committed to reinvigorating tourism in the region and would develop a ‘San Francisco style fisherman’s wharf’. Perhaps the strangest plan to reinvigorate tourism was offered by John Abbott, who said the solution would be ‘Paradise Angels’ – reincarnations of the famous Meter Maids who have helped ease parking fee woes since the 1960s. Audience members were also given the chance to voice their doubts and concerns following the formal debate, with most questions centered on issues of trust. One angry resident asked why the three current councillors (Peter Young, Susie Douglas and Eddie Sarroff) should be trusted to deliver for the city when they had so far failed to make a difference to their divisions. While the night provided a few tense moments, candidates and audience members agreed that the Gold Coast was in need of a revamped public image. Colourful contender Dean ‘Aussie Elvis’ Vegas said the local media had a key role in creating a positive outlook for residents. “People who live here are proud of their city and for once I would like to see our local paper, The Bulletin, stop bagging the Gold Coast and to give us a fair break,” he said. Photo: From left, candidates Eddie Sarroff, Peter Young, Tom Tate, Dean Vegas, Keith Douglas, Susie Douglas, time-keeper Bri and (standing) moderator Nicole Dyer. Photo courtesy Candice Marshall, ABC Gold Coast.